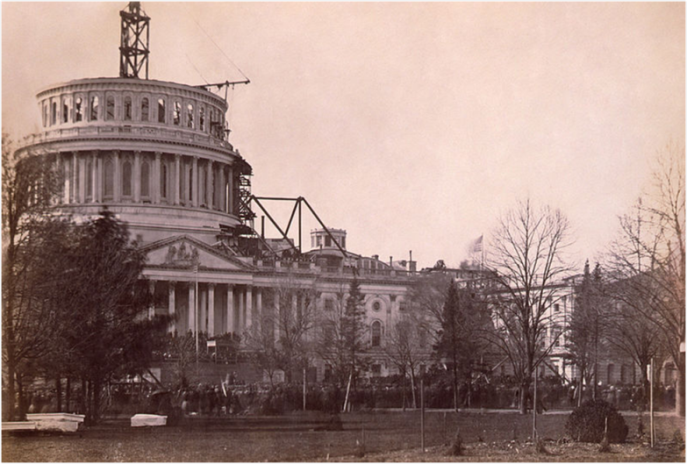 One hundred and fifty years ago today, on December 2, 1863, the United States Capitol Dome was completed, adding its own distinctive grandeur to the skyline of our Nation’s capital city. Last month in November 2013, a two-year project began to restore the aging dome. Read all about it on the Architect of the Capitol’s website about the US Capitol Restoration Project at http://www.aoc.gov/dome. While most of the focus on the Capitol these days pertains to politics, this anniversary is an appropriate time to reflect on the art and architecture of one of our National Treasures, the US Capitol, along with the artists, architects and engineers who helped make it a showplace worthy of a world class city. 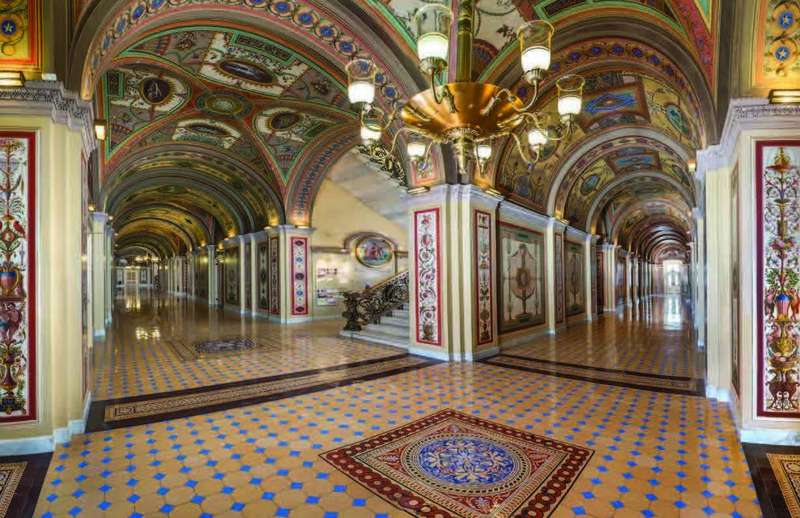 Following are a few of the more outstanding publications about the US Capitol art and architecture. Prepared for the Bicentennial of the construction of the United States Capitol in 1994, Glenn Brown’s History of the United States Capitol is the definitive history of the construction of the Capitol, including the many trials and tribulations along the way, such as the burning of the Capitol by the British in August 1814 during the War of 1812. The Army Corps of Engineers played a significant role in the design and construction of the Capitol Dome and the rest of Washington, DC. In the enjoyable and anecdote-filled book entitled Capital Engineers: The U.S. Army Corps of Engineers and the Development of Washington, D.C. 1790-2004, readers can discover the politics, passion, inspiration and innovation that went into crafting the landmark historic monuments, public buildings and infrastructure that makes up the Nation’s capital, including sketches and insider stories about the design and construction of the United States Capitol and Dome. Once the Dome was completed, it was decided that it needed to be a showcase of the finest art. For those visitors lucky enough to come to Washington, DC, and take a tour of the Capitol, they marvel at the “monumental fresco” in the Capitol Rotunda, called The Apotheosis of Washington, that reminds one of the Sistine Chapel and the incredible frescoes along the walls and ceilings of the corridors and special rooms, such as the President’s Room. In this stunning new publication, To Make Beautiful the Capitol: Rediscovering the Art of Constantino Brumidi, the United States Senate Office of the Curator provides an updated history of the work on the Capitol by Italian-born artist, Constantino Brumidi, who spent the last 25 years of his life making the Capitol into an awe-inspiring piece of art worthy of his own native land’s masterpieces with his frescoes and decoration of the walls and ceilings. Includes new discoveries about the artist, his inspirations and genius resulting from recent extensive restoration of his work to its original glory. The 160 pieces in the catalogue represent the work of 111 artists, including such celebrated figures as Gilbert Stuart, Alexander Calder, Augustus Saint-Gaudens, Thomas Sully, and Daniel Chester French. 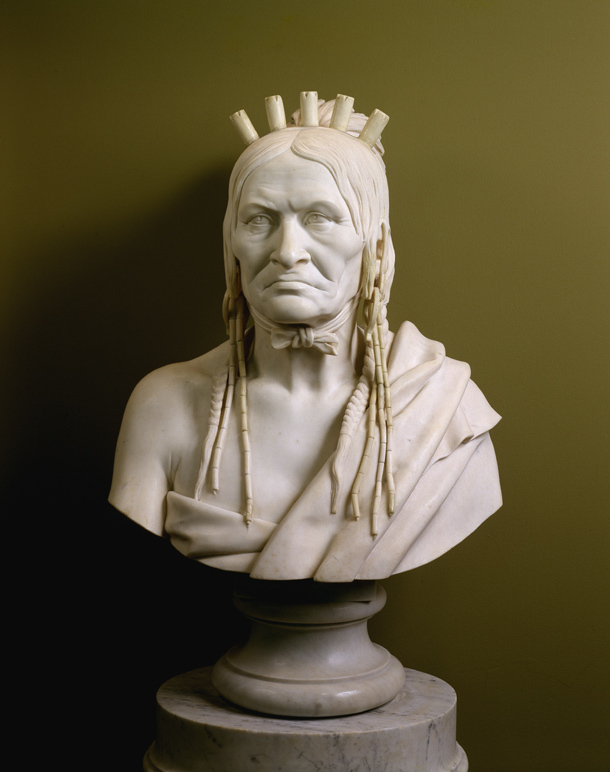 Many of the works feature prominent senators, including portraits of Everett McKinley Dirksen, Mike Mansfield, and Robert A. Taft, and small bronze sculptures of Henry Clay and Daniel Webster. Although portraits dominate the collection, the American landscape is represented by an oil painting of Niagara Falls in winter. Major events are also documented, such as the first reading of the Emancipation Proclamation by President Abraham Lincoln and the first manned moon landing. There are two special collections: a collection of vice presidential busts, and a series of paintings of major U.S. army posts completed by Seth Eastman. In 1870, the House Committee on Military Affairs commissioned artist Seth Eastman to paint 17 images of important U.S. Army forts in the United States after the Civil War. He completed the works between 1870 and 1875. For many years, the fort paintings hung in the rooms assigned to the House Military Affairs Committee, first in the Capitol and later in the Cannon House Office Building. 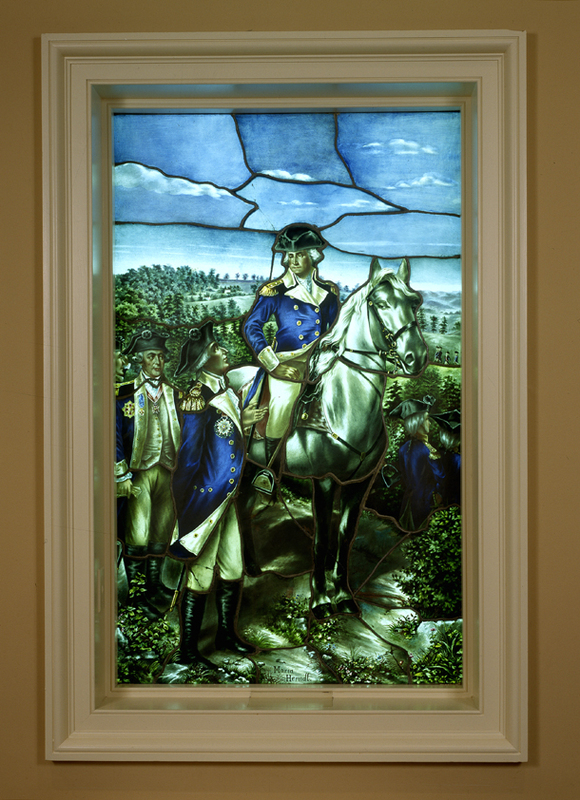 During the late 1930s, they were returned to the Capitol for public display. Of the 17 paintings, 8 are located today in the Senate wing. This Eastman Forts Print Set includes a booklet, “The Eastman Forts, A Guide to the Print Set,” and 10 color prints of Eastman paintings of the following ten forts: Fort Mackinac in Michigan; Mifflin in Pennsylvania; Trumbull in Connecticut; Tompkins and Wadsworth in New York; Scammel and Gorges in Maine; Delaware in Delaware; Snelling in Minnesota; Taylor in Florida; Defiance in New Mexico (now Arizona); and Fort Rice in North Dakota. 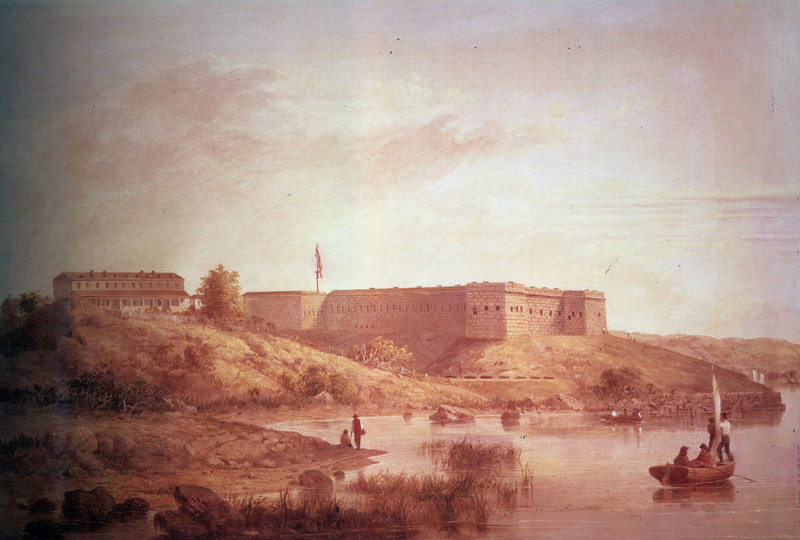 Image: A painting of Fort Trumbull, Connecticut, by Seth Eastman, commissioned by the U.S. Army in 1870, and hanging in the US Capitol. Part of the Eastman Forts Print Set. 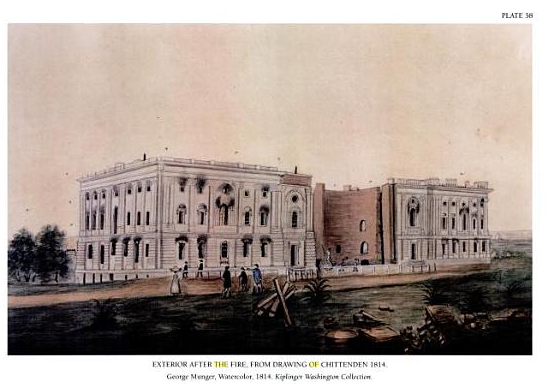 Some of the art about the Capitol was not included in the building itself, but was produced outside of it by the press and media of the day. Prior to the advent of modern media with color photographs and live audio and video, Americans received their news and images from newspapers and illustrated news magazines, which included both hard news and softer features full of engravings, portraits, political cartoons, and illustrations. The United States Senate Catalogue of Graphic Art reflects this coverage mix of both hard and soft news. 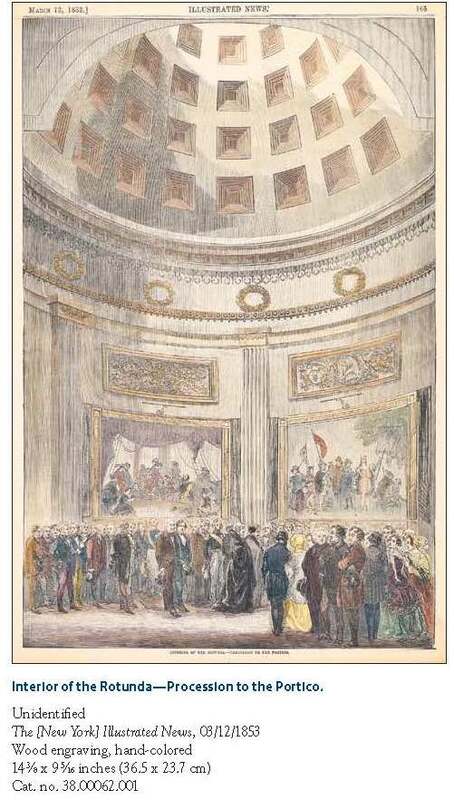 The catalogue includes prints involving the Senate that depict important events of the day such as the debate over slavery, the impeachment trial of Andrew Johnson, and presidential inaugurations. But also featured are prints capturing the daily rhythms of the Senate such as the crowded Capitol corridors, Senate pages delivering documents, lobbyists pleading their case, meals in the Senate dining room, and idyllic scenes of the Capitol building and grounds. How can I obtain these publications about the US Capitol Art and Architecture? Shop Online: You can purchase these publications from the U.S. Government Online Bookstore at http://bookstore.gpo.gov by clicking on the links above in this blog post or clicking here to shop our US Capitol Art publications.